Microsoft this week for the first time offered its Office for Mac applications in Apple's Mac App Store. 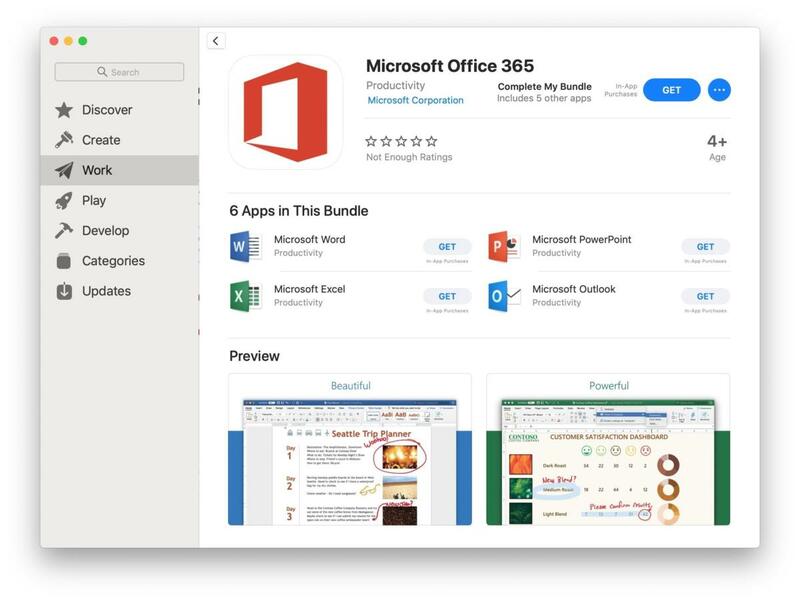 "We're excited to announce that Office 365 is now available on the newly redesigned Mac App Store," Microsoft executive Jared Spataro wrote in a Jan. 24 post to a company blog. The Office applications - Excel, Outlook, OneNote, OneDrive, PowerPoint and Word - can be downloaded separately or as a bundled collection from the Mac App Store, Apple's e-market. While the applications can be downloaded - and even run in a reduced functionality mode that bars actions like creating and editing documents, and sending and receiving email - the customer must already subscribe to Office 365 or obtain a subscription through an in-app purchase to unlock their full potential. If the latter, people have a choice between the $100-per-year Office 365 Home (alternately, $10 per month) and the $70 Office 365 Personal ($7 per month). It's unclear whether Apple will scrape its usual 30% off the top of Office 365 in-app purchases - as it does for all app revenue - or if Apple and Microsoft came to a different financial agreement. Enterprises can also leverage the Mac App Store by using the Apple Business Manager dashboard to distribute the Office 365 applications to employees covered by corporate-grade subscriptions such as Office 365 Business or Office 365 Enterprise E3. The applications are not any different from the ones Microsoft offers for download from its website or from a customer's Office 365 web-based control panel. They do differ, however, from those covered by retail "perpetual" licenses, including Office Home & Student 2019 (a $150 one-time purchase) and Office Home & Business 2019 ($250). One of the advantages of acquiring Office 365 through the Mac App Store is that the market then delivers updates and upgrades, rather than the Microsoft-made AutoUpdate app on macOS. There is no difference between the purchase price through the Mac App Store and via Microsoft's website. Discounts, however, can be found at online outlets like Amazon, where "Key Card" options were priced today at $88.21 for Office 365 Home and $58.99 for Office 365 Personal. Apple first announced that the Office applications would land in the Mac App Store in June 2018, during its annual developers conference. The Mac App Store has been in operation since January 2011. Unlike the iOS App Store, the one for the Mac is not the sole distribution platform for macOS software; developers can sell their wares from their own websites, for example, or in packaged form through online or brick-and-mortar retail stores. A short FAQ on Office in the Mac App Store provides additional information about the applications and Office 365.